If you see this, hit the button on the right and let us know! This is a very serious exotic invasive pest. An exotic parasitic plant known as giant Asian dodder has recently been introduced into Texas and threatens a variety of trees and landscape plants in Houston. Giant Asian dodder (Cuscuta japonica Choisy) is often cultivated in Asia for medicinal products and may have been intentionally introduced into Houston for similar purposes. The problem is that it has recently escaped and invaded street trees and landscape plants in several Houston neighborhoods. First detected by City of Houston crews in August 2001, dodder has since been found in half a dozen neighborhoods, primarily in southern residential districts of the city. 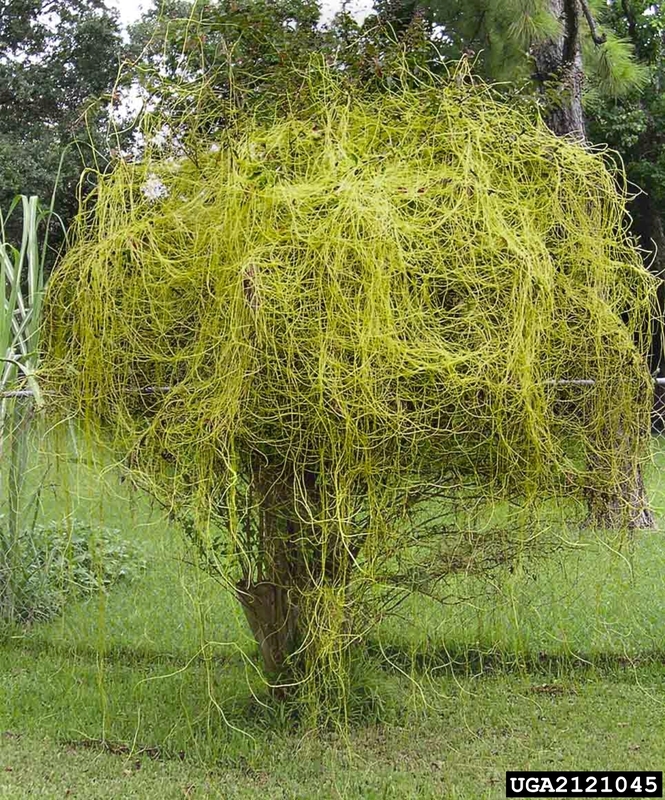 Giant Asian dodder is a yellow-green vine that resembles spaghetti (Fig. 2A, B). It is able to parasitize a wide range of hosts including many agricultural crops (alfalfa, tomatoes, and onions, among others). Giant Asian dodder has been observed parastizing 20 host plants in southern Texas ranging from herbaceous plants to woody ornamentals (such as live oak, crape myrtle and Ligustrum).